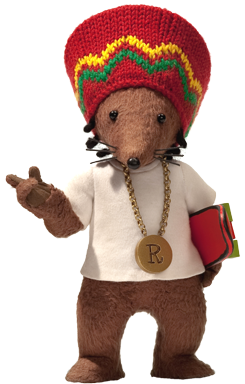 Rastamouse, the Cbeebies preschool hit features stories showing how people can get on and solve problems through understanding, love and respect. Rastamouse's ethos is to "make a bad ting good" to teach right from wrong, and help wrong-doers redeem themselves from their mistakes. Mackinnon & Saunders made the puppets for this fun-filled series. Working closely with director Derek Mogford (who also directed the Puffs tissues commercials) the team adapted the designs from Genevieve Webster and Michael De Souza’s wonderful Rastamouse books into functional three dimensional puppets. Lots of research went into sourcing and dyeing fur fabrics in which to cover the cast a search which took our fur experts all around the world…on their computer! Meanwhile our costume department took on the task of miniature knitting for Rastamouse’s trademark hat.